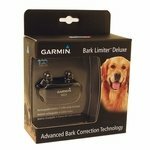 Garmin/Tri-Tronics BARK LIMITER Deluxe No-Bark Collar (Rechargeable). $99.99. 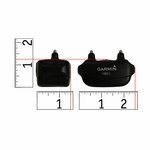 What's new in the Garmin Bark Limiter? 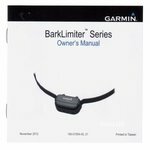 Autorise Stimulation -- Garmin has added a setting to the BarkLimiter that allows the unit to automatically increase stimulation levels as your dog barks to find the correct level. Unlike direct set stimulation levels, the Autorise feature uses 18 levels of stimulation. This allows the unit to ramp up very quickly to stop rapid barking and to get to the right level fast. The advantage of an autorise feature is that the unit can deal with high distraction situations that need higher levels and then after the barking is over the level will drop. The next time a lower distraction situation comes up, the unit starts low so that your dog isn't over corrected. I have had great success with this type of feature in other brands of bark collars and I am glad to see it in the Bark Limiter. The majority of my dogs work fine in an autorise mode but I have a few that don't. Some dogs are just really driven to bark and they require a high correction level the first time they bark and everytime after that. These dogs will not do well on an autorise bark collar and will require a high direct set level. The downside of autorise is that you are going to have some barking. This mode might not be what your particular barking issue needs and you might be better off with a direct set level. Vibration Settings -- In Vibration mode, instead of correcting the dog with static stimulation when he barks, the collar will vibrate. There is no electric stimulation at all. It is not a warning or a precursor to stimulation, it is only vibration. I can't say it won't stop a dog from barking but I'll be real surprised if it does, especially over time. Some dogs may find vibration to be startling at first, but once your dog figures out that there is no downside to it, you will need to move to a mode that has a stimulation correction. Keep in mind that if you have used vibration on a remote training collar to communicate with your dog you will be making a mistake to try and use vibration with your bark collar. 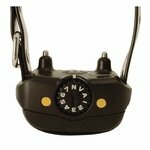 Coin Slot Dial -- This is a very simple way to operate the collar and it's easy to tell what level you are on. The down side is that you do not want a dial that is easy to turn. If it's easy to turn then there is a chance that the level could get changed while the collar is on the dog. Garmin has made this dial stiff. This makes it hard to turn by hand but there is little chance it will change levels by accident. To make it easier to use, there is a "coin slot" in the dial that lets you use a penny, dime or quarter to turn the dial. You can also use a flat head screw driver or any other flat tool. I am not a big fan of external dials. We have several products that use them and I don't like them. There are a couple of things about the Bark Limiter that make the dial an improvement over a button, but I'm still not a fan. When we have trouble with older versions of the Bark Limiter, the majority of the time it was an on/off button issue. Every time you changed anything on the old Bark Limiter you used the on/off button. Once it failed you were done. The dial should fix that. Also, changing levels on the old Bark Limiter was a pain. You had to scroll through all 5 levels to lower the stimulation. It was hard to explain and it took time. The dial fixes that. Integrated Contact Points -- The Bark Limiter no longer comes with short and long contact points. The new integrated contact points are designed to work with long and short haired coats. This is a new trend in bark collars and we have not seen many issues with not being able to get good skin contact, but some dogs will require longer probes. If that is the case with your dog, you will need to try another brand. The Garmin Bark Limiter now comes in two versions: A standard version that is simply called the "Bark Limiter" and a deluxe version called the "Bark Limiter Deluxe." 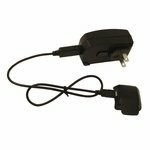 1) The standard version uses a non rechargeable user replaceable 3 volt battery. 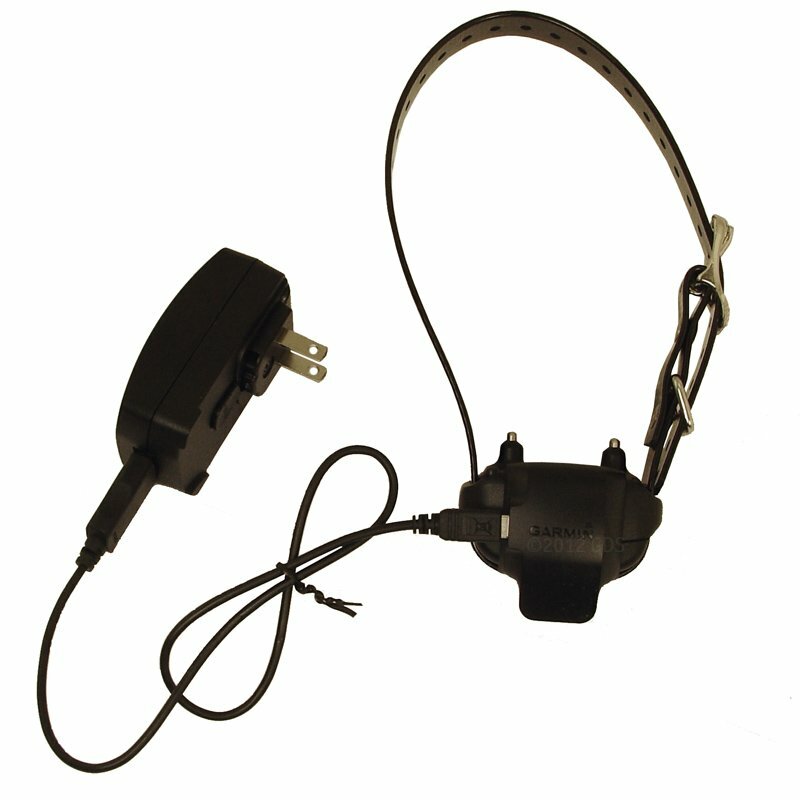 The Bark Limiter Deluxe uses a rechargeable battery. 2) The Deluxe is slightly smaller than the standard version. 3) The Standard version is $79.99 while the Deluxe is $99.99. In the past I was not a big fan of rechargeable bark collars. My take on them has changed as battery technology has improved. We get pretty good results out of rechargeable collars now. The price of replacement batteries will make up the $20 price difference pretty quick! 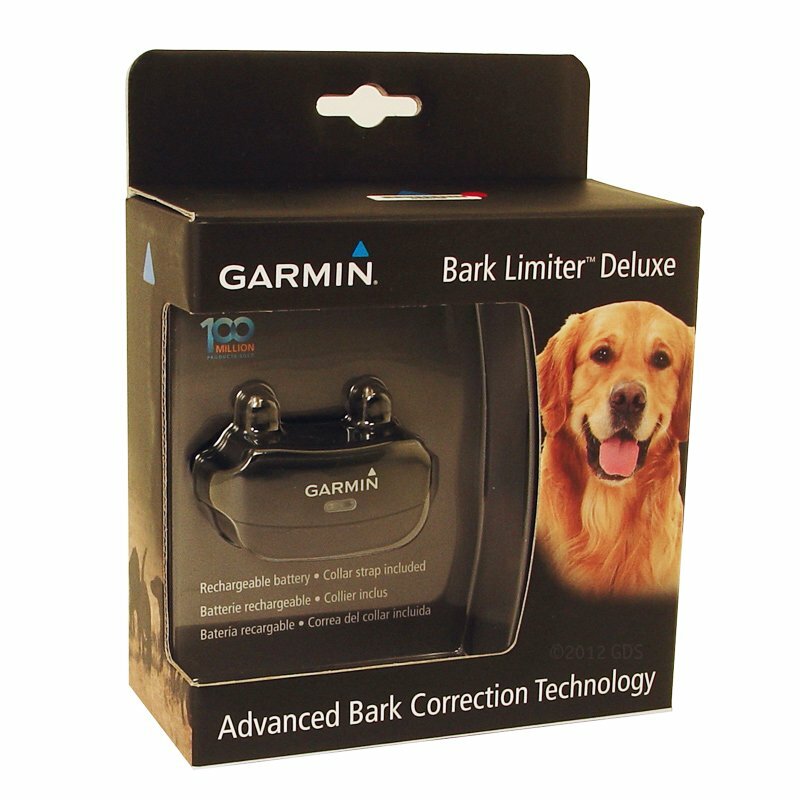 If you look around at other sites on the internet that also sell the Garmin Bark Limiter, you will find text that talks about this unit being able to "recognize qualitative differences in barking." These websites claim that the Bark Limiter can tell the difference between "obsessive or nuisance barking" and ignore "good" barking. This is not true. Garmin originally intended to make this concept part of the design of the new Bark Limiter but were unable to do so. 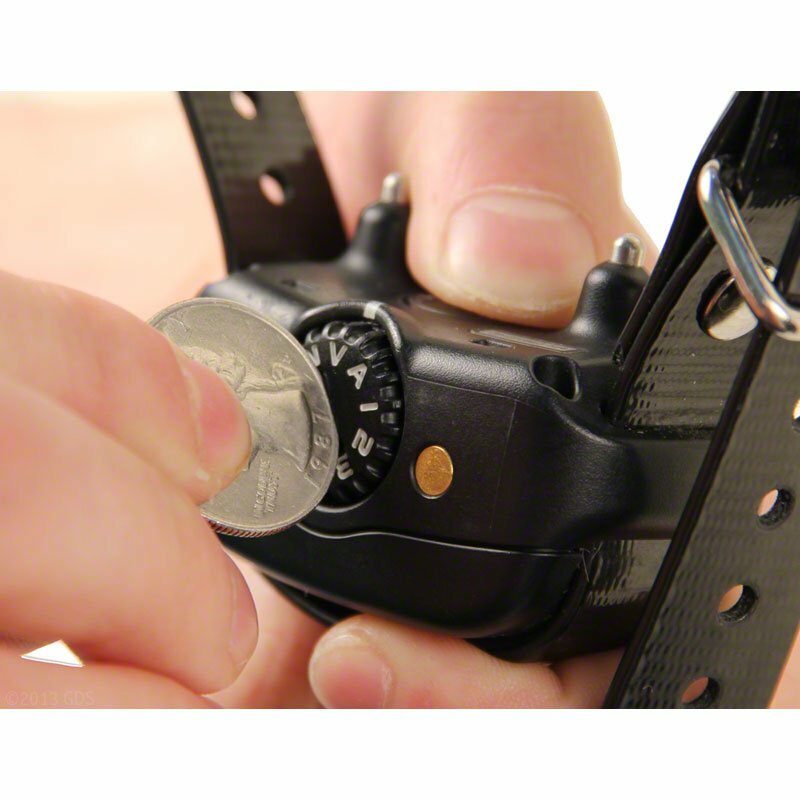 While this is a feature that many folks would love to have in a bark collar, the Bark Limiter can't do this. The reason these websites claim that the product will do this is because Garmin accidentally included this text on its website and several distributors sent the info out to their dealers. The Bark Limiter can not tell the difference between "good" barking and "bad" barking. Anyone that tells you it can does not know what they are talking about. What the Bark Limiter does do is differentiate between barking and other vocalizations. This is pretty typical in bark collars today. We find that many sounds that a dog makes will not be seen as "barks" by the unit. This is a good thing, but sometimes we have dogs that learn how to make sounds that the unit will not correct. 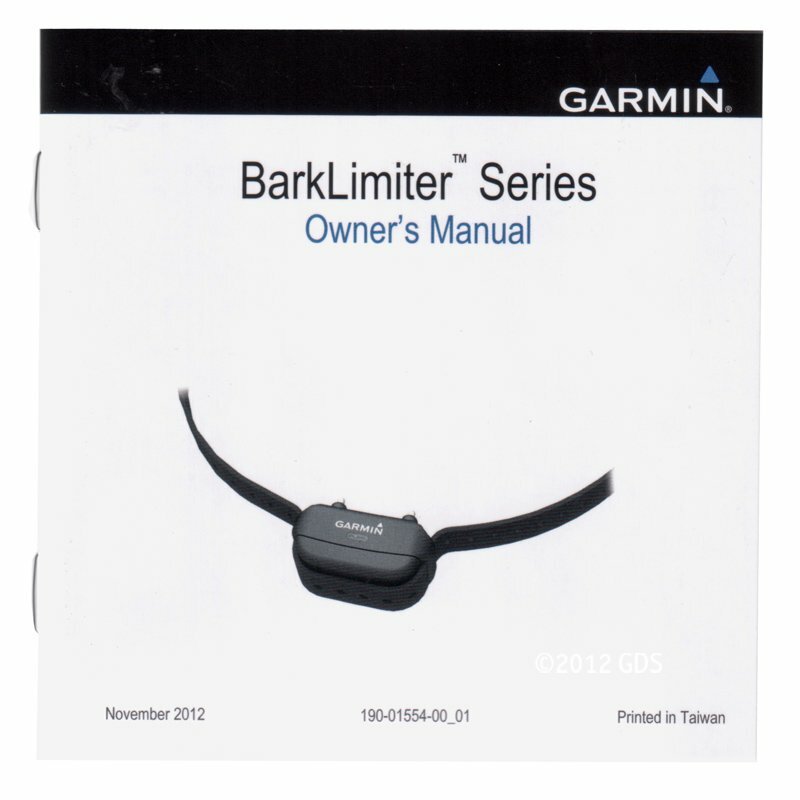 Today we're going to take a look at the Garmin Bark Limiter products. 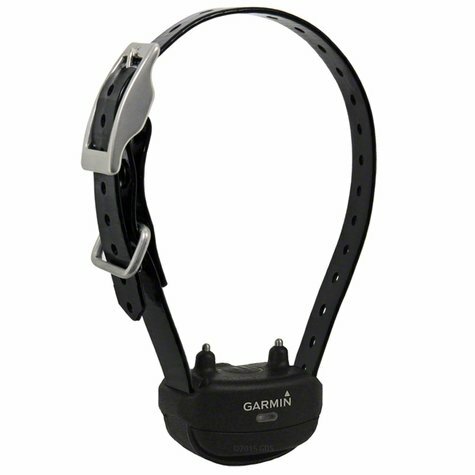 These are bark collars made by Garmin based off of the Tri-Tronics design that we've had the last 10 or 12 years. There are two versions of the bark limiter. You have the rechargeable which is just a little bit smaller and then you have the battery operated which is just a little bit bigger. That's the only difference between these two productsâ€”rechargeable, battery operated. There's an up and a downside to that. It really just depends on what you want. Rechargeable technology nowadays is pretty good. You are not going to have to charge this really that often. Once a week would be plenty for most folks. You may be able to get away with even going out longer than that. It really depends on how much your dog barks. 10 years ago I hated rechargeable bark collars because they had so much downtime. You had to charge them every day. You'd have these situations where you needed your bark collar but it was out of battery. Nowadays it's just not that common. The technology is really good. So, not a lot to worry about there. There's a price difference between the two of them, about $20. So that's something to keep in mind. The size difference is not that great either. It's just not that much bigger. On a little bitty dog it may make a difference. But for most dogs it's not going to matter. So it really just depends. The dial has N, which is a neutral position. It cuts the collar off. Then you have V, which V is a vibration only mode. When the dog bark it gives a vibration. There is no electrical stimulation involved whatsoever. It's strictly vibration when he barks. The A is a rising stimulation. The way this bark collar works, when the dog barks it gives a correction at the lowest level. When he barks again it gives another correction. If he continues to bark, the stimulation increases until you get to a level where the dog stops barking. I like rising stimulation in bark collars. It allows the dog to figure out which level is going to work for him. So I'm a big fan of it. Some people don't care for it because a dog that can take a lot of stimulation is going to be able to bark several times before it reaches that level. So a lot of it depends on your situation. My dogs wear bark collars not so much because of my neighbors, because I live out in the country. They wear bark collars because of me. I don't want to listen to them. So when they are wearing a bark collar, they get a bark or two in. something comes up and they choose to bark once or twice. It's not really that big of a deal to me. I just don't want them to bark constantly. So most of my dogs work in a rising stimulation. Then you've got direct set levels, which this unit has 1-7. Some dogs just don't work well in a rising stimulation mode and you want to be able to give them an exact level based on what they need. So you've got seven different levels to choose from. Now, a dial on the outside of the collar can be a problem if it's a free spinning dial. So what Garmin has done is they've made it where you need something to turn the dial. A penny works really good. You can use a screwdriver, anything like that. You can turn it by hand, but it's not easy. And so, they've got a little key slot there. You just take your penny and you set it. What's nice about this particular collar is that once you figure out what level you want to use, you can actually leave it there the majority of the time. A couple of features that this collar has, it has a sleep mode. So if your collar is on and it's on the dog, you take it off and you leave it on Level 4 and you set it down, after a short period of time, once it's motionless the collar is going to power down. What that does is conserves battery life. The idea behind it is if your dog is curled up and he's asleep, he's not going to need the bark mode, so it powers down to save battery life. Well, the same thing is true when you take it off the dog. So if you figure out the level that you want, you set it on that level and you can leave it there pretty much all the time. If you do that, though, you miss out on one of the features. Garmin has what's called a bark odometer. The system will record the number of times the dog is corrected. And so, if you set it on a 4 and now you want to see how many times your dog barked while you were gone, take it off the dog, turn it back to N. Before it shuts down it's going to blink at you and tell you how many times the dog was corrected. So if you turn it off and you get no blinks or one or two, then you go, "OK. Good. The 4 is working." If you get 30 then you know your dog has been barking the entire time you were gone. We need to increase the stimulation level. So it's a pretty neat feature. It's called the bark odometer. Both collars have them. "Helped with the excessive barking immediately." Helped with the excessive barking immediately. Love the way it adjusts to the level required for each situation. "What a truly magnificent tool." What a truly magnificent tool. We purchased 4 collars and rotated them around the 8 hounds the first week. Now they only need to wear them on occasion, as their group bark pattern has changed. Can't imagine why we did not buy these sooner. Hound music is only music when they are on a track!! "It took two days, and the dog is now bark free to our ears...."
"This product has outperformed my expectations!!" This product has outperformed my expectations!! I had bought a training collar when he was 6 months old. The batteries in that collar lasted 2 hours. The Garmin bark collar is highly effective at a low setting, and the charge lasts a very long time. I will always buy Garmin and will always buy from Gun Dog Supply!! Thank you!! "Solved the problem in a day!" Does exactly what I wanted it to do. Solved the problem in a day! Great product!! I bought several bark collars from a national retail pet store chain and had no luck with them. Garmin's collar corrected my dogs behavior immediately. The best part is I never have to replace the batteries. Superior product! Younger dogs learn from the get go that the kennels is a quite place. The older ones that forget, get an overnight reminder. Excellent, a must have. Lasts a long time on one charge. Small, convenient, and works very well. My neighbors love it! This is the collar I will be recommending to friends and family. Despite my dogs' thick long hair, the prongs work well. And no more battery replacements! My dog is always barking when I leave and go to work late at night. 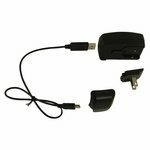 I bought a Garmin tri-tronics bark collar and it works very great, no more barking! Works great. Told a friend how well it works and loaned her mine to try out. She ended up buying two for herself. She uses it on a little terrier and a dachshund, mine are for my labs. The Garmins are working perfectly unlike the last two spordog units I bought that switch covers fell off in 2 days and shocking was all the time,I had to quit using them. Great bark collar! Very effective in ending the barking out of the car window that my chocolate lab engaged in as we traveled to the dog park! I love that it is rechargeable, too! These collars work so well and keep my neighbors very happy. Just what I was looking for. After making the correct stimulation adjustment, it has performed with excellence. The warning light on the rechargeable battery could use some work. The battery is working, but giving off a false recharge signal after a few hours of use. Stopped him from barking quickly! Awesome product and service. Easy to handle and charge. Also light weight. The bark collar worked instantly with my one year old Weim. I rarely have to use it now. She got the message only after a couple of low 'hits'. My house is much more peaceful without the barking! Use the collar at night only. First night two barks at different times. After the first night, no barks. Collar really works well on Auto setting. Worth the money spent. We have a GSP 4 year old we rescued. She wants to go out in the yard to hunt the instant the sun comes up, and she barks like a nut. And she's hard to calm down. This does the trick. You can literally hear it work as she tries to keep barking and reconsiders. A worthy purchase! I have several other brands of bark collars. 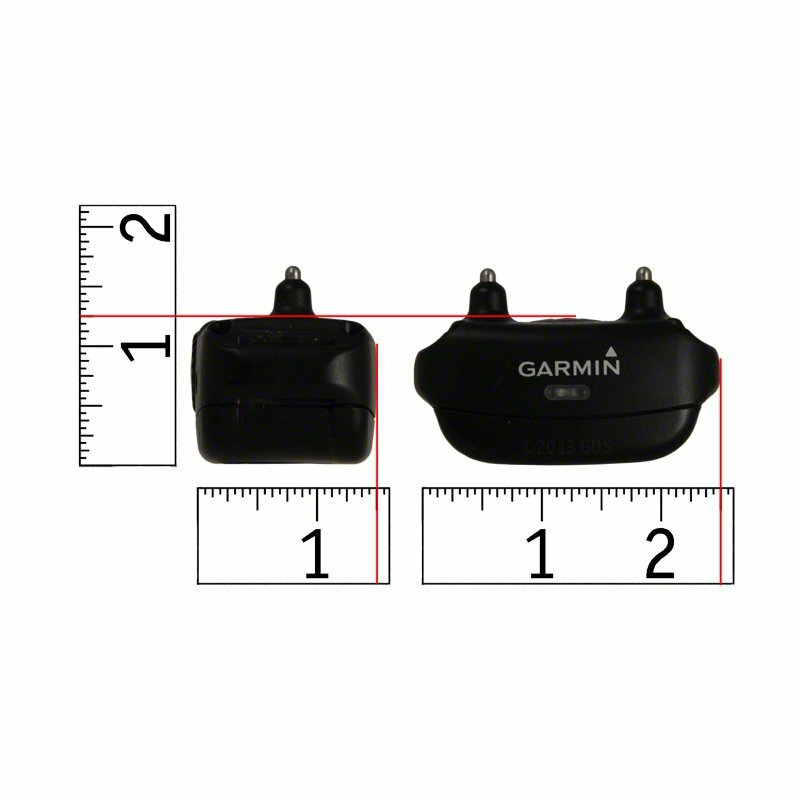 These Garmin/Tri Tronics are 10x better as with all other Garmin Dog products. I have other collars and prefer this because it is waterproof. I have recommended to others, and both of them bought it also. Great collar for the $$. They have been very effective in keeping my kennel quiet! Works great. Peace and quiet in the home and the hotels when on the road. They keep so quiet the hotel staff are surprised dogs are in the room during servicing. Best collars ever purchased!!! Really works well. Like the fact it keeps track of the number of times dog barks, so you can adjust it. Great product. The barking has stopped. The neighbors love it too. Brittany Spainel. Hunts. Family pet. Works like it's supposed to. Great for those living in the cities and need to control your dog's barking. Works very well. I like it a lot, dogs don't. I ordered another one. LOVE it...and so do my neighbors. One dog, female Terv, moved on to a dummy collar in less than a week. The Laekenois boy is taking longer. The Sheep Dog girl is just started...not so easy because her coat is SO dense. I only put the collars on when they are outside, and I'm in the house. Thanks for a great product. It works great. Use it once, and dogs know it means business. This is as good as the Sportdog Tec 1 is bad! I've got the quietest dogs in the neighborhood, unfortunately this collars quality is offset by my Tec 1 collars lack of quality! Bought this for a problem barker. I have it set for the increasing stimulus, and it really worked for her. Never even had to use the shock. He does great with vibration. He liked to bark at the deer every night, he's so quiet now. Got one for our lab/husky too. My only wish is they made them for toy dogs with just vibration. Rechargeable feature is the way to go. Own a battery operated model of a different brand and had to replace the battery every 2 weeks, costing $14 a pop. Not only is this one rechargeable but I get at least two weeks or more out of it before it needs recharging. The sleep mode helps preserve the battery life. I like the auto setting which incrementally increases the stimulation if barking continues. Just charged up and works like a charm. Even on a heavily coated breed like mine. Very happy with this product. Big buckle makes collar easy to put on. Recharges quickly. Works great - no barking when they have their collars on. Gun Dog Supply is a great company. Fast and courteous service! Great collar with some great features. Seems to work really well for my current setup. Thanks! This was bought as a replacement for a bark collar I bought over 10 years ago from Gun Dog Supply. Quality products and great customer service. This is a great collar. Just remember to not put this on your dog and leave it on until you are sure you know your dog knows how to stop the collar. My dogs learned very quickly what was causing their problem, which was their barking. This rating of excellent is for Gun Dog Supply rather than for the bark collar. Unfortunately, after ordering this collar but before it arrived, my dog sustained an injury that has confined her to the house (she doesn't bark in the house, only in the yard), thus we have not used the collar on her and probably won't need it on her for a while yet. However, I am pleased with the promptness of shipping and all aspects of customer service. We have ordered products from Gun Dog Supply in the past and have always been satisfied. All I have to do is ask my youngest dog if he needs the bark collar and he stops barking. I only had to turn it on the first two days. After that, just wearing it stopped the behavior and now just the mention of the bark collar does it. Amazed at how well the Garmin/tri-Tronics Bark Limiter Deluxe No-Bark Collar works! Dogs seem happier as well as everyone around them, wish I had the collar years ago. So far so good. Quick charging unit. Easy to set up and ready for use. Bark counter is very helpful for adjustment. Works great! Seems to hold a charge for quite some time! Very happy with my purchase. It works better than any we've used before. The collar is great! The Autorise Stimulation and Bark Odometer is wonderful. And, Sleep Mode is another nice feature. The collar has not been recharged once yet and it has been 8 days! Gun Dog Supply's review of the Bark Limiter is comprehensive and informative. Great job! I have had many barking collars over the years of owning hounds. So far, these collars have worked better than any I have owned. Makes sense... Technology should be getting better right? Ask me in a year rather than a month and I will tell you how rugged they are. Hounds have a way of wearing things down. One loud bark and she spun around and was quiet. About every 4th day I put it on her and usually didn't turn it on and she was quiet. Excellent product, but it could use a different type collar, minor issue. It works great. The battery charge last a long time and it's nice to just plug it in for a fresh charge. The best trainer yet. Had a problem with one of my dogs that was barking for 2-3 hours after I would leave the house. He would also bark when I would return home until I greeted him. After 2 days use of your BARK LIMITER, he no longer barks while I am away. The setting I used was 5 and that did the trick. Thanks for a great product at a reasonable price. The bark limiter deluxe works great. My only complaint is that I don't carry change in my pockets, so the mode dial can be a pain to turn. I know that we don't want the mode to change during normal use, so I can deal with that. The people at Gun Dog Supply are great to deal with. Very quick shipping. No problems and easy to use. I love it, it stops unwanted/ nonsense barking. I am a huge Garmin/ tri tronics fan and wouldn't buy any other brand. Excellent product. Two of my dogs are whiners, gets really annoying. This collar works on whining, as well as barking. Great price as well. Outstanding! Excellent battery time and I love the auto setting. A great investment that both I and my neighbors appreciate. Collar has really helped with nuisance barking, starting with the first time the dog wore the collar. Two of my dogs are whiners and gets really annoying. This collar works on whining, as well as barking. Great price as well. This product is wonderful! Within a week Ruby stopped barking and now does not bark even when she is not wearing the collar. Over the years with various dogs, I have tried petsafe and sportdog stuff and nothing worked better than the Garmin deluxe. I won't buy anything else for bark control. Works GREAT! They don't care for it ,but I love it. Thanks they work great for my dog . One of my dogs barks at every sound she hears at night. I put the collar on her and the first night she barked 3 times and quit. Sense then she only barks once if at all. Very reliable and very effective. Simplicity, durability, and ease of use make this collar perfect for anyone to use. It works like a charm! Love them!!!! I find that these collars work best if put in auto mode. You have to be careful about how tight you put the collar on your dog. With a bit of trial and error they work great. Best collar for the money that I've ever owned. Battery life is very good. Love the select dial for correction. Most excellent!! It gets the job done! Works great in the auto position. Very effective at controlling all levels of barking. The on sale price was excellent for the value and my mistake was not buying four units instead of two. My only reason for giving 4.5 stars instead of five is my personal belief that there is always room for improvement. Thank you for a great product at a great price. Works well, less barking happening!!! It was easy and it really works. I seriously love this bark collar. Every time I would get home, my dogs would bark and bark and bark, which is fine if it's someone they don't know, but they'd bark at me, Every single time. Then they'd carry on for at least 30 minutes. Finally, I have peace whenever I get home now. I have three English Springers, and they learned really fast what happens when they bark aggressively. I now leave the collars on the vibration setting because then they get a warning and they think it'll get stronger if they keep it up. Money well spent! My only issue is that I have to charge them every 5 days or so when I read somewhere that it was around a week. But really, that's not even a problem! It is the only bark collar that I use. I love it's flexibility and it holds a charge for a long time. Easy to use. Battery lasts. It is smaller than the old ones. They work at a very low setting. Even my stubborn Barker is quite on a low setting. I prefer not to use but gotta do something during a full moon or the turkeys wonder by, lol. Definitely recommend them. Has stopped three dogs from uncontrolled barking. Use it in auto mode so they can bark for short time before getting corrected. Great product from Garmin to help w/ nuisance barking. Very humane way to train my dogs when it is appropriate to bark and when it is not. The correction is graduated and after a week or so, my dogs learned the desired behavior and were no longer receiving a correction. Over a month into it now, I don't need to use the collar nearly as much as when I first started training. My current practice is to put the collar on them when additional reinforcement is needed and most of the time, I do not even turn it on and the desired behaviour is elicited. Of course this device is not a substitute for patient work with your dog, but a great tool to help with training. I bought two, and one of the collars wouldn't charge fully. But they did send me an extra rechargeable battery. The Collars do work very well!! Shih tzu. Hunts. Family pet. AMAZING!! I'm sure our neighbors hated our dogs because I was starting to dislike them myself. The NON-stop barking was making everyone crazy! I had purchased 2 other brands to stop the barking. We have invisible fence so I knew it had to work. The other collars slowed them down for a day or two. Having the ability to adjust the collars AND finding out the number of corrections they receive have made all the difference! Worth EVERY penny I paid!! One of my dogs has terrible anxiety when riding in the car. She was so bad I hardly ever took her anywhere. When I put this collar on her and put her in car it literally seems to have a calming effect on her. She remains quiet, relaxed and comfortable and we both enjoy the ride. I take her everywhere now. So far, so good. If you order this item, it's best to start out on low setting. Way more sensitive than other bark collars. I was leery of buying a bark limiter, but based on the information on Gun Dog Supply and a great deal I took the chance. It is simply amazing. We didn't have a severe barking problem, but a whining and the occasional 'come unglued moment' when getting home from work. It was getting to the point where we would sneak into the driveway to go unnoticed or race to let him out. Well, that leads to bad habits, so I didn't want to continue that trend. Instantly the tri tronics bark limiter worked. We used the automatic setting, and it seems to work excellent for our needs. He never barked often, but when he did now it's all gone. No more whining even. Love it! I watched several of your bark collar videos, and Steve, I am like you. I didn't buy this collar for the neighbors, I bought it because I can't stand a dog to bark just to be barking (nuisance barking). Within 2 days, there was silence around my home. Thanks for a great product and a great service. I ordered the bark limiter deluxe weeks ago and was not told it was on backorder. I called Gun Dog Supply yesterday, and they said they had gotten them in and did not know why mine was not sent. They said they would mail it today. We will see!!! I was so pleased with my first Garmin bark collar that I purchased a second when it came on sale. I have three working border collies that rarely bark, except when they are within earshot and can both hear and see me working with one of them. The two awaiting their turn would bark in frustration. It was impossible to verbally correct them without upsetting the one I was working with. I use the 'auto' setting, and quickly the peace was restored. I especially like the feature that allows me to monitor exactly how many corrections were utilized over each session, and thus easily track the barking behaviors of each individual dog. Now all three rarely trigger more than a couple of corrections each session. The self charger unit is well worth it, and very easy and convenient to use. I recommend this product without reservation even for 'sensitive' breeds. Great product, and excellent service. This was a very good purchase, my bouvier is behaving much better. I am using the Autorise feature, he does manage to bark twice at most then he is quiet. It took my dog one time of wearing the collar and getting corrected to realize he needs to keep quiet and not bark at everything, including his older sister dog that doesn't want to be bothered by him. Works fantastically! I'm very satisfied ! Collar seems to work great and last forever on a charge. It causes very little neck irritation even after 3 to 5 days. The numerous settings allow for even the most sensitive hound or the most stubborn. Get this bark collar, don't waste time and money on cheaper collars. It works great on auto mode. My dog is adjusting well. He is 10 years old; who said you can't teach an old dog a new trick? After a week of using the shock, my dog doesn't bark if the collar is on her. Now I just put it on vibrate and put the collar on her. Happy with the this collar. Works perfectly, only needed it for a couple of days for my dog to learn to control her barking. Works great. I like that it a broad range of correction levels. I use it on a 1 year old, who has a problem grasping when to bark, and when quiet is required. This collar has helped him get the point. Being able to recharge it makes it even better. No more looking for special batteries. Nice to have some peace when our hound is outside.LOVE Gun Dog Supply ices and products. GREAT Customer Service as well! Works great. Little fellows are not nearly as aggressive when they are not barking. Works great! My dogs hardly bark at all now! Works great, like the fact I don't have to replace the batteries or wonder if there even working! I bought these to try and calm all the barking in my house, they work wonders. I had them on auto for a week and went from 24 corrections the first day to 3. Now I leave them on vibrate and the house is peaceful again. They work so well I'm thinking about getting some for the kids.JUST KIDDING!! Awesome product and holds a charge for 2 weeks no problem. Quieted my kennels after 1 week. It is the best! My dog from day one stopped barking it is worth every penny. Compact, easy to set, easy to recharge, simple instructions. Works so much better than the remote control one we had as there's no hunting for the remote while the dog is barking. I love the automatic setting. It lets our dog get a couple of barks in but cuts him off before it becomes annoying. Because it's on all the time there's much more consistency so now as soon as it ramps up he quiets down without having to go to the high setting we needed for the remote one. More comfortable for him and us and way more effective overall. The rechargeable battery is great. No more letting him bark because we forgot to get spare batteries and the stores are closed! Great collar! Bought it on sale so the price was awesome as well! Good batteries and a nice size unit! "This collar is a miracle worker!!" This is the second one like this that I have purchased. My Scottie does not wear it all the time now, but it works like a charm. Before this collar, she barked all the time. The battery lasted for over a year and shuts off when she is inactive. This collar is a miracle worker!! "I really like the automatic setting." We have two collars we rotate between dogs. They hold their charge for a long time and work great. I really like the automatic setting. "The collar took away her tendency to build up her emotional level." Using these collars on our Mals has cut down aggressive barking from crates in the car while they are waiting for training. I also used one on Harpy during a thunderstorm and carefully watched to see if it would make her more anxious when I repressed her barking and crying. Within a few minutes, she curled up and went to sleep. The collar took away her tendency to build up her emotional level. "It worked so well that I ordered another for our other Mal." I bought one of these for a dog that barks when left in her crate if we are home. She also is quite vocal during thunder storms. I had some concern about using this collar, since I didn't want to increase her anxiety. Long story short, wearing this bark limiter actually appeared to reduce her stress because it discouraged her from building up from her own barking. It worked so well that I ordered another for our other Mal. I was also pleased with how rapidly these collars arrived after I had place the orders. "You will love the results you will get." I have a plot hound, and he seems to love to bark a lot. I had to do something to help teach him not to light up over everything. I used it for the first time last weekend when I could monitor the him with the collar on all day at home. I should have bought this device a long time ago. It works and works well. In one day of training with this collar, my hound is seen and not heard from. After a week, he is very quiet. Two barks once in a while, not the noisy hound I had. Get one. You will love the results you will get. I have not had a chance to try it as of yet. "So far it's working very well." Recommended by friend who has a kennel. Being used to pair correction of behavior and barking cessation. So far it's working very well. Very good! Barking? Not now! Barking ones or two, but that is it! Thank you so much! "Good unit purchased out of necessity." Good unit purchased out of necessity. As soon as my dog became part of the neighborhood choir, one grouchy old dude spoils the fun. Actually sorry we put him out. So voila. We introduced the Garmin over a weeks time, so the pup could still go outside, and it has worked great. Garmin has good stuff, period. It was too strong on Auto. Works very well on vibration, but I have an invisible fence, and it is causing a problem when dog gets near it . Unfortunately too much snow just now. I will cut wire if necessary. Any ideas? Great collar. Long battery life. Keeps them quiet. Fabulous product. Would recommend it to anyone who has experienced a barking problem. Worked immediately. Very fast shipping. Very pleased with the service. Thanks! "Sure is quiet on the hill"
Sure is quiet on the hill. It works great, it did exactly what I wanted it to do. "My dog has quickly adapted to this collar when I'm away." My dog has quickly adapted to this collar when I'm away. I especially appreciate its automatic setting and the feedback it provides after I've been gone of how many times the collar was activated. This collar has greatly reduced my stress and helps me better understand my dog's behavior while I'm away. Great. I have walker hounds. Use for deer hunting. Wanted to control barking in the kennel. Within two days the barking stop. Left it on one extra day, then removed. No correction needed since. "It didn't take long for the barking to come under control." It didn't take long for the barking to come under control. Had many collars. This one works great. "The technology for this Bark limiter is outstanding." The technology for this Bark limiter is outstanding. Very versatile unit. "I have tried several different bark limiters, and this is the only one that actually works!" I have tried several different bark limiters, and this is the only one that actually works! "Gun Dog Supply is one of the best companies I have done business with." Gun Dog Supply is one of the best companies I have done business with. Always helpful and when I tried to buy a holster for a remote that wasn't even available I was given one for free. "This collar is everything that I had hoped for." I just adopted my dog three weeks ago. He barked at just about everyone and everything. He is 6 or 7 years old, but learning fast. This collar is everything that I had hoped for. I've got five of these collars. We love them! Makes for an enjoyable barn! "The collar worked even better than expected"
The collar worked even better than expected, and now she only has to wear it occasionally. Love the quiet, and I'm sure the neighbors do too!!! No problems. Product works in limiting barking with first use. "It really works, and my rottie doesn't seem to dislike wearing it." It really works, and my rottie doesn't seem to dislike wearing it. And it will keep her unwanted barking episodes from getting us both kicked out of where I live! "Since he is small we temporarily replaced the large rubber type collar with a smaller soft nylon collar." This unit completely solved our dog's excessive barking problem in less than two days. Since he is small we temporarily replaced the large rubber type collar with a smaller soft nylon collar. Works perfectly and is high quality. Now he only uses it occasionally as a reminder. The battery seldom needs recharged but when it does, it's very quick and easy. The instruction booklet that comes with it is thorough and easy to understand. I must also mention the incredibly fast shipping - thank's Steve!! "Worked like a charm. Now he just has to be wearing it and he won't bark!" shih tzus and chihuahua. Family pet. "The ability to see how many times the dog barked is amazing, a good way to use the lowest level setting as possible!" This isn't my first bark-collar, but it is my favorite. The ability to see how many times the dog barked is amazing, a good way to use the lowest level setting as possible! "I like the collar so much, I've ordered another!" I like the collar so much, I've ordered another! "Works way better than the Petsafe one we had before!" Great...works way better than the Petsafe one we had before! "We only had to use the vibration mode to control/stop the barking." We only had to use the vibration mode to control/stop the barking. What a great Christmas gift for everyone! "For my little dachshund, who used to bark all day long, I use the low setting #1, and it does the trick." I got this for my 34 lb hound, who used to bark right through the other collars. This one keeps him quiet. I use the automatic setting. For my little dachshund, who used to bark all day long, I use the low setting #1, and it does the trick. "She responded very well, and we are very pleased." She responded very well, and we are very pleased. "Only product that I've found that actually works." Only product that I've found that actually works. Spent a small fortune on other products. GunDogSupply will now be my first and last stop for all future purchases! "These work great, as they are compact, and you can leave on your dog without having to worry about them causing irritation or sores on your dogs neck." These work great, as they are compact, and you can leave on your dog without having to worry about them causing irritation or sores on your dogs neck. Also like the rechargeable battery, as the older model had the CR 2 battery which could get expensive on aggressive barking dogs. "Great product and great service from Gun Dog Supply." Great product and great service from Gun Dog Supply. "Our dog is better behaved, and we have a much quieter house." This collar has been amazing!! It worked instantly! Our dog is better behaved, and we have a much quieter house. Very happy with it!! "From the first time it was on my dog, I was impressed." From the first time it was on my dog, I was impressed. This collar is everything it is supposed to be. I love it. "Really works great, and my dog only needed it for about 3 days"
Really works great, and my dog only needed it for about 3 days, and she got the hint, but she wasn't a barker only barks when I leave the house early in the morning, and she thinks I'm going hunting. "One word of advice is to make sure the collar is on tightly enough or else it won't work properly, especially on dogs with thick fur (like mine)." This collar works like a charm!! It is just what we were hoping for, and what we desperately needed to keep our 10 month old female high energy GSD quiet and calm. The bark collar is a solid fix for a vocal dog who just likes to bark too much! It keeps her from getting too revved up on walks, at dog parks, and even just at home in the backyard when she hears noises she is unfamiliar with. One word of advice is to make sure the collar is on tightly enough or else it won't work properly, especially on dogs with thick fur (like mine). "The bark limiter is working great, and I received it in a timely manner." The bark limiter is working great, and I received it in a timely manner. "Worked almost instantly for a longstanding problematic bark." Worked almost instantly for a longstanding problematic bark. Nothing short if a miracle. Thanks so much for a great product, and excellent service! "Very effective. I have it on the automatic setting. My neighbors are much happier!" Very effective. I have it on the automatic setting. My neighbors are much happier! "Awesome collar. Best I've used." Awesome collar. Best I've used. "Only put them on high 1 day, then down to low rest of the time." Only put them on high 1 day, then down to low rest of the time, and they are easy to charge and to put on. "Worked nicely with my puppies. Barks started at 90 a day, and now we are down to less than 20! Neighbor is happy, and so am I!" I purchased two Bark Limiter collars for my GSP puppies due to my neighbor complaining about my dogs barking. These worked like a charm. I like the bark counter feature. I also like the "A" setting, graduated stem feature. Worked nicely with my puppies. Barks started at 90 a day, and now we are down to less than 20! Neighbor is happy, and so am I! "The feature that I like the most is when you pull the collar off, it tells you how many times the dog barked and allows you to adjust the setting to stop the barking." Tried other collars, and needed additional collars to stop the barking. The feature that I like the most is when you pull the collar off, it tells you how many times the dog barked and allows you to adjust the setting to stop the barking. "The nuisance barking stops immediately. In 30-45 days, they rarely need to wear it." Awesome, says it all! The nuisance barking stops immediately. In 30-45 days, they rarely need to wear it. Thanks so much! "Have been using it on auto, and it seems to be very kind to my year old pup learning the rules of my kennel, which means no barking at night." Small and lightweight. Excellent purchase. Have been using it on auto, and it seems to be very kind to my year old pup learning the rules of my kennel, which means no barking at night. "Good product. Works well. Excellent company to work with." Good product. Works well. Excellent company to work with. "I've been through a handful of bark collars and finally hit the jackpot with this Garmin." I've been through a handful of bark collars and finally hit the jackpot with this Garmin. I like the rechargeable version, and it seems to give me about a week of life before charging. I also like the adjust-ability, as it seems my dogs run the gamut of "needs" of this collar. I wish I'd gotten this sooner. I squandered enough expensive batteries to buy a couple of these. "We have 2 young dogs. Worked great, but the real test was our 7 year old male. He barked his head off til we got the Garmin." Outstanding. We have 2 young dogs. Worked great, but the real test was our 7 year old male. He barked his head off til we got the Garmin. Tried others, just didn't work. Now, quiet bliss. Best I've ever had after using many. Nicely built unit. Provides excellent results. Didn't hurt that the dog is a quick learner. I was really reluctant to use this, and hated seeing the look on her face, but it was necessary in the car. We started her on vibrate and got great results. Haven't had to move up yet and hope not to have to. Time will tell. Otherwise, the quality is good, shipping from GDS was efficient. I like doing business with these folks. "I bought two of these, and they work great." I bought two of these, and they work great. I used the increasing setting, and they bark a couple of times and then stop which is perfect. "This is a great product that is well built and easy to use." "So far, the collar works great." So far, the collar works great. I find that lower vibration settings worked well, and I didn't need to turn the dial above 4. Working well. My 6 year old female is a quick learner. Great bark limiter. I especially like the feature that it is motion activated to save battery power. Great product. I would recommend it and your company very highly. "Very well built and highly-featured." Very well built and highly-featured. I like the idea of it being re-chargeable. Good deal for your money. "Now I just put the collars on and they don't even try to bark." Got 3 of these for my dogs and the vibration feature didn't seem to bother them so I put it on auto for 1 day and...... Silence!!! Now I just put the collars on and they don't even try to bark. Much cheaper than a privacy fence for the neighbors they bark at. Did not have the opportunity to use it yet, but it does look like good quality and I have the impression you are a very good company. Will let you know. Holds a charge great. Sensitivity seems to be dead on... Will even stop the whining and the bark counter is a nice new feature. Works well. Nice to keep track of the number of corrections each day. Battery lasts good. My Cocker would bark constantly. The collar has brought peace to our home. I felt such embarrassment toward my neighbors. It was the responsible action to take. She doesn't coward when I put it on her and I remove it in the evening during tv time. Her sweet personality is the same. I love the product and highly recommend it. My dogs stopped barking in less than 10 minutes after putting on the bark collars. I will recommend the to my friends. Worked immediately. I can let the dogs in the back yard at any time with collar on and there is no barking. Love, love, love it! So much more peaceful around the house now! Should have bought it sooner!!! Didn't take her long to figure things out! Works great. Would recommend it for anybody who has a barking problem. Because it will stop the barking problems. Put on after charging and BAM no more barking. Works great. I should've bought 2. A miracle has occurred! Sorry I didn't purchase these years ago. House is peaceful and quiet! My fella was learning some irritating habits which the bark collar cured immediately. The only thing I wish it had is a warning to the dog before the shock. "So far, my wife and I are very pleased with the performance of the Garmin on Daisy Mae, our coonhound." So far, my wife and I are very pleased with the performance of the Garmin on Daisy Mae, our coonhound. Two features we like a lot are the ability to recharge it and being able to put it either on auto or a particular setting. For potential customers, I would recommend watching Steve's video explanation of the Garmin as that is what really sold me on purchasing this bark collar for our hound. In the past, have always bought Tri-Tronics. Last bark collars, I was not impressed. They were not rechargeable. I love this Garmin. I have two barkers, one a german shorthaired pointer and the other a border collie. The border collie will bark at dirt but not with this collar on. Did I mention that this collar is rechargeable? Love it! Works as advertised! Gun dog Supply personnel are knowledgeable and helpful l! "Collar is working very very well..."
"Lives up to the Garmin reputation." Good equipment. Lives up to the Garmin reputation. "It works very well and will be getting a second one for our other dog." It works very well and will be getting a second one for our other dog. The problem with it is that it sometimes fires when the other dog barks, if she is real close. This is about the 6th collar I have bought. They work for a very limited time. I have bought the rechargeable it lasted for 2 charges. I have replaced the batteries in others and they don't work. It's great when it is working. My Scottie get very aggressive when she barks, and the collar at level 4 stops her. I do not even know if it works. I also have a Garmin e Collar. As soon as I put the training collar around the dog's neck, the Lab morphs into a perfectly behaving angel. Just putting the Bark collar around his neck has the same effect...no more barking. Perhaps Garmin should sell dummy collars like the Invisible Fence folks do. Dog does not know the difference. Excellent for one dog, who is a quick study & before was quite a general-purpose barker; hers is set on Auto, so goes up incrementally if/when she barks. Her sister/littermate is more stubborn (or less bothered by it); hers is set on 6 (next-to-highest), and she barks less, but if another dog walks by she appears determined to bark in spite of the correction. Next step is highest setting, #7. I would recommend this item to anyone with the very fair caveat that you already have online re: some dogs just being barkers, almost no matter what. Really like this product. Only withheld the 5th star because the 'Active' setting doesn't allow for normal 'play' type barking. Our Catahoula mix is very vocal, almost to the point of talking back. The collar inhibits even that noise. Other than that, I LOVE this product. My sons dog is hyper and his girlfriend's puppy also aggravates my older lab. The bark limiter has really curbed the barking and jumping every time someone enters the house or they go outside. Very pleased compared with other bark collars. Works pretty good. Some of my dogs need a refresher course from time to time. It's a little hot, so be careful. Auto and vibrate features are great. Could use a little better collar. It does what it says. My puppy has separation anxiety when I leave him on one side of the fence and I'm on the other. The bark collar silences the squealing. I purchased the product because the brand was highly recommended by friends that own bark collars. I chose this particular model for the ability to increase the correction if my dog kept barking. I am going to have to play with the levels though to find the correct one for him. The only problem we have with the collar is our dog is quite smart, and he found that he can use his paw and move the collar off to the side of his neck even when we have it quite tight. Thus it is not as effective as it should be in that position. If you have any suggestions on how to fix this problem your help would be greatly appreciated. I like that my family and I can now enjoy our dog because he's not constantly barking at what is on TV or who is walking outside. A few things I don't like about the collar is there is no on/ off switch, the battery dies very quickly and a few times it had a delayed reaction to where the shock didn't work until about a minute after excessive barking and it must have been a high number shock because my dog literally flew across the couch and yelped. Maybe the collar I received is defective?? Thanks! I like the way the collars perform but I am not crazy about the three piece charging cord. I would prefer they were set up for a one inch wide collar so they could be put on a standard collar. That might help so they don't know as easily when they have them on. Easy to use and rechargeable. I am rating this on the 3 older ones I have. I haven't gotten around to using the new ones. So far it seems to work as expected. I much prefer the push-button on the old Tri Tronics Bark Limiter, and while it's not a problem for my dogs, I don't understand why they got rid of the interchangeable contact points for longer haired dogs. It is annoying to dig out a coin every time I need to turn the unit on/off, but I am hopeful that the rechargeable nature of this device makes it worth it to give up a couple of other nice features. I have used this collar on two occasions and seemed to slow down the barking. I find the collar easy to charge. I plan to purchase a second collar to correct a second dog. The collar with a buckle is hard to take on and off. I replaced my collars with nylon collars with quick snap closures which make it much easier to take on and off of the dogs. If this collar option was made available it would move my rating to five star. We have used other collars (PS) and they are effective but do not have a vibration mode. I like the Garmin for having this feature. The collar itself doesn't feel as durable as the PS but time will tell. Overall it's a nice piece of dog gear and I would consider purchasing again. Would have given it five stars, but have not had it long enough. If it holds up as long as my originals, then it's a winner and a 5 star product. It needs charging quite often. I have another bark limiter, but it isn't rechargeable. It works great, but the battery is hard to find in my area and they only last about 3 months tops and are pretty expensive. So the rechargeable is working just as good as my other one right now. I hope the battery life is better. I like the bark limiters much better than the SportDOGs for sure. They are built much better and last much longer. Own 4 of these. Work well. Really like the auto rise. Like the small compact size. Do not like having to adjust dial every time to activate it. I would prefer the old style of set it/forget it. If I store it at night on 3, it won't work unless I roll the dial to A, then back to 3. All in all, I like it. It was recommended to me, and it does work well. I only wish it had more settings, so there isn't such a big jump in correction levels from one to the next. The collar has achieved exactly what we had hoped. Our dog is no longer barking excessively. We really like the progressive mode so that he does not get a severe correction right away. It increases only if his barking continues. The one thing that could be better about this collar is the buckle. Would love if it had a snap closure instead for ease of putting it on and off. The reason for 4 stars is because I ordered this with a heavy heart. This was a last resort after other training methods didn't work. He is the most strong willed dog I have ever met. We stopped taking him for walks and rides in the car. The barking was out of control and embarrassing. After 2-3 days of training he got the message. His quality of life is so much better. He is back to car rides and daily walks. Seems to work well, kind of a hassle with not being digital power. Doesn't seem to affect the chiweenie but it does seem to work with the schnauzer. Not giving up, though. There is improvement. Steve. The only problem I have with the collar is my other beagle barks next to the one with the collar and the collared dog gets a correction. Also, if the collared dog belches, it gives a correction. Keeps my dog a little anxious. Thanks. The collar strap is a cheap poor imitation of the older Tri-Tronics collar straps that were excellent. Wouldn't take much more than two dog bites to put it in half. The bark collar itself works fine the strap is cheap junk. The question is really not appropriate, since the Bark Limiter that we received was obviously a one-time defective fluke. We returned it, but it is probably unfair to rate it unfavorably since it appeared to be a one-off defective. I do not like the fact that I need a coin to turn the unit on. Very inconvenient. Think the smaller Dogtra is a better bark collar. We're using manual level 6 because auto didn't correct quickly enough. My crazy hound figured out quickly that if he shakes vigorously he can move the shocking part of the collar to the side, which makes it not so effective. If it's situated directly below his neck, it works pretty good. It works better than other brands I've tried. It's not holding the charge more than a couple of hours at a time. When it is charged it works well, but just won't stay charged. This collar has no effect on my dog's barking. I even shaved the hair on his neck for good contact. This is a dog that responds well to a remote collar, so I believe the stimulation from the bark limiter is not effective. The collars go off too easily. Not only other dogs barking, but rubbing the dog's neck and on occasion even while removing the collar it gives a correction. This is making the dogs confused and in one case shut down. I like the Garmin products. I like the size and weight of this collar, and I thought the bark odometer would be useful. But I am very disappointed in the consistency of this collar. While in my presence, the dog was corrected for quietly burping, and when I checked the bark odometer it said he was corrected several times, but he had been quiet. He also got a correction while I was taking the collar off the dog. So I don't know if this single collar is defective and not the norm, but I will be returning it and trying another brand. Disappointed in Garmin. It stays charged for a max of two days. I'm made aware that it needs charging by my barking dog. The worst. What a waiste of $100! When I first put it on him, it zapped him and he didn't even bark. After that, it worked maybe twice. Now, he just barks and barks and it doesn't even work. I bought this collar for my dachshund since it was rated for smaller dogs. It definitely shocks him when he barks, but it also shocks him when he hasn't barked. I tried it several different times, and it kept happening, so I had to stop using it on him. I also have a SportDog NoBark for my larger dog, and it does not have the same problem. Would not buy Garmin brand again. Autorise Stimulation mode automatically increases the stimulation to the correct level as your dog barks. It will also increase levels if a high distraction situation causes your dog to bark excessively. This way you do not have to go through the task of testing levels to see what your dog needs. How Autorise works: The Autorise feature starts at level 1 when the unit is turned on. When your dog barks he will get a correction on level 1. If he barks again he will get a second correction on level 1. If he barks a third time, the unit will increase stimulation by two levels. If your dog continues to bark he will get two corrections at the new level before the collar increases two more levels. Once the collar reaches the needed level to get the dog to stop barking, it will slowly lower the stimulation by one level at a time. If your dog barks again while the unit is at the lower level, the unit will start at that level and then increase again as needed. Over time, the unit will return to level 1 once your dog has stopped barking for an extended period of time. The Bark Limiter has a vibration setting on the dial. Instead of correcting your dog with static stimulation when he barks, the collar will vibrate. 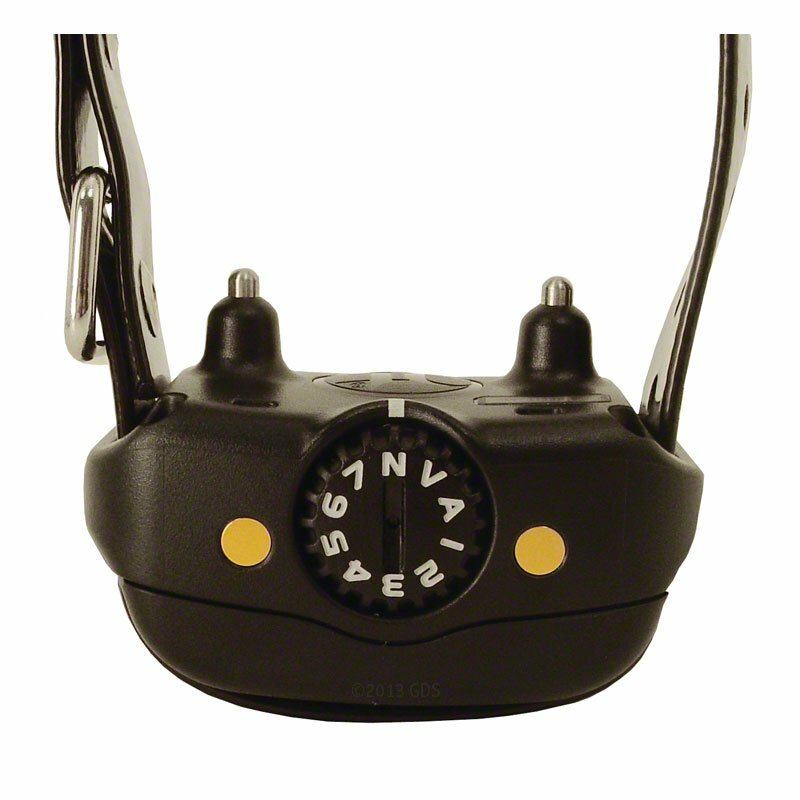 The Bark Limiter has 7 levels of direct set stimulation levels used to correct barking. Direct set levels give the same amount of stimulation every time your dog barks no matter how many times he barks. To use direct set levels effectively, you need to test your dog over time and get a feeling for the level that he needs in most situations. The Bark Odometer can be very helpful when getting a feel for what level your dog will require when you are not around to watch him. The Bark Odometer counts the number of times your dog is corrected while wearing the collar, and counts them back to you when you turn the unit off. This way you know if the level that you have set for your dog is working for him while you are away. If you have no corrections or just a few, then your level is set high enough. If you have several corrections then you need to rethink the stimulation level that you are using. To activate the Odometer, set the dial to "N" which turns the unit off. The Odometer will then flash the number of corrections since the last time the unit was turned on. When your Bark Limiter is motionless for a short period of time it drops into Sleep Mode. This is designed to save battery power when the unit is not needed. The Bark Limiter can go into Sleep Mode when it is removed from your dog or while your dog is motionless. Sleep Mode allows you to leave your Bark Limiter dial set to the mode or level you need to control your dog's barking, even when the collar is not in use, without draining the battery. The rechargeable Bark Limiter Deluxe is listed by Garmin as being able to go three months between charges. This will vary depending on what stimulation settings you use, how much your dog barks while wearing the collar, and how many hours a day your dog wears the collar. The collar can remain set to the desired mode or manual setting while recharging. When you first turn the dial on the Bark Limiter from "N" to a level or setting, the light on the collar will glow for 5 seconds. The color of the light will tell you the condition of the battery. Green means "good," yellow means "charge," and red means "dead." The unit will work in yellow mode but immediate attention is recommended. The unit will not work at all when the light is red. Engineered to fit all dog breeds and all coat thicknesses. Compact, Lightweight, and Waterproof -- weighs just over 2 oz.